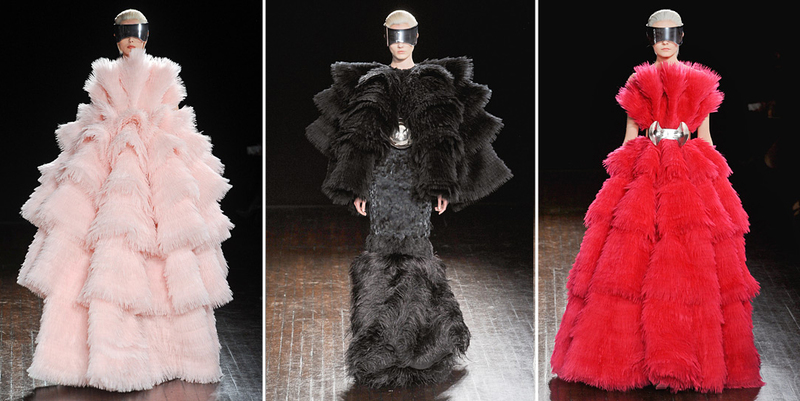 The Alexander McQueen Fall/Winter 2012 finale certainly didn’t lack drama. With billowing layers of rose, black and fuschia organza overwhelming each model, the show exhibited a theatrical, feminine twist on modernity. Designer Sarah Burton describes the collection as, “a kind of soft futurism. Not cold and structured, but optimistic and forward-looking.” In an industry where the future is so often summed up by high-tech nuances, extreme sculptures and harsh silhouettes, it’s refreshing to see a designer forage for an optimistic execution. Mirrored eye shields, slick hair and overbearing shapes surely denote futurism, but add to that, feathery textures and echos of floral petals and you’re left with a new definition for progressive fashion …and, lest we forget, a whole collection of options for the likes of Anna Della Russo, Daphne Guinness and Gaga. Yikes. It’s been a while. You can always tell when my life has changed in some way by my posting patterns. Ahh what can you do. While I’ve been regrettably ignoring my blog, the Fall 2012 shows have been turning out the latest movements in New York, London and Paris. It’s always a bit overwhelming to sift through the innumerable collections, noting resemblances in cut, colour, texture and influence, but of course, it’s also quite dreamy to get that fresh taste. As with most Fall seasons, the usual suspects showed up to the party; fur, leather, chunky knits, fun Winter accessories and all those woodsy shades we love. Those that haven’t necessarily been on the invite list in previous years, but made obvious appearances, were things like peter pan collars, jumpsuits, white tights, peplum, and billowing leather pants. That last newcomer was a bit of a surprise to me, seeing as though leather is typically shown in legging form on the Fall runways. I can’t imagine how slouchy leather must feel to wear, I would think not ideal for the typical work day. 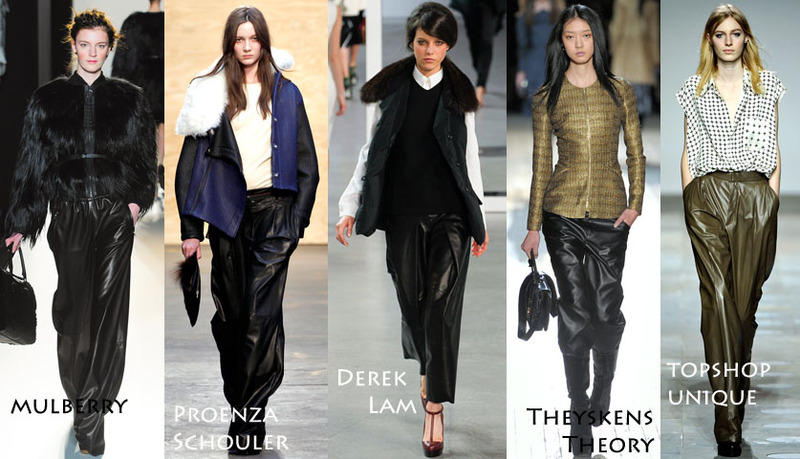 Nevertheless, each of these looks prove that baggy leather can be worn in countless ways, and doesn’t look quite as ridiculous as one would think. What are your thoughts on the slouchy leather trend? While it may seem as though these Winter months are here to stay, it’s comforting to think that Spring’s inauguration is just a little over a month away. The typical formula for Spring fashion entails florals and pastels, trench coats and bold stripes. This year however, designers have turned to the treasures of the sea to usher in the months of rainfall and blossoms that are upon us. 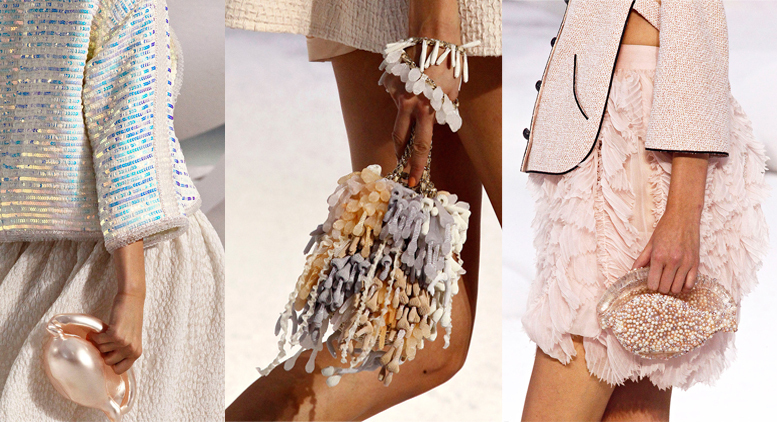 Seashells and corals of all sorts turned up on Spring 2012 runways in the form of statement-making accessories. Now’s the time to dig out that starfish pendant or start the hunt for sea-inspired pieces to add to your Spring wardrobe. There’s nothing like daydreaming of a warmer season ahead and the clothes you’ll be wearing…especially when the heavenly seashore is involved. 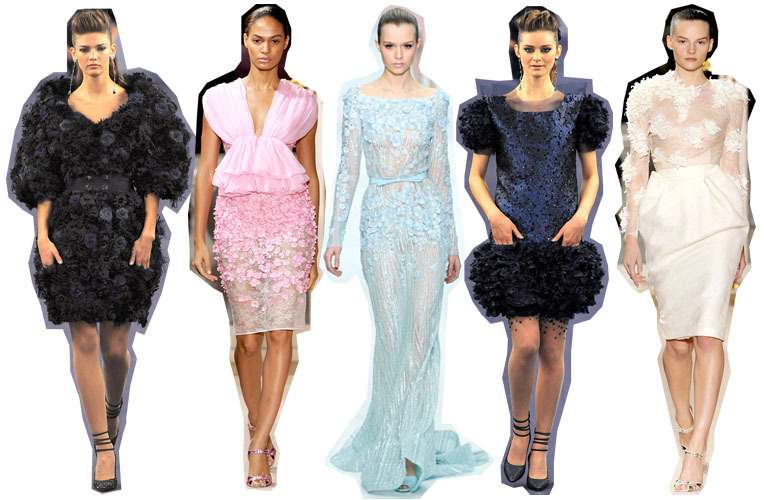 Spring 2012 Couture’s three-dimensional florals were met with quite the contrast in trends. Translucent pleats, pencil skirts, peplum waist lines and delicate cuts were paired with none other than fierce crocodile in jet black and sand. Collections like Christian Dior, Giambattista Valli, Givenchy (not pictured) and Armani Privé (not pictured) embraced the material, presenting it in its most ladylike rendition. Whereas in other seasons, we’ve seen crocodile coated on accessories like shoes and bags, today’s edition gives us practical suit pieces for the modern woman. A vicious animal at its most polished and proper – just steer clear of the real deal! 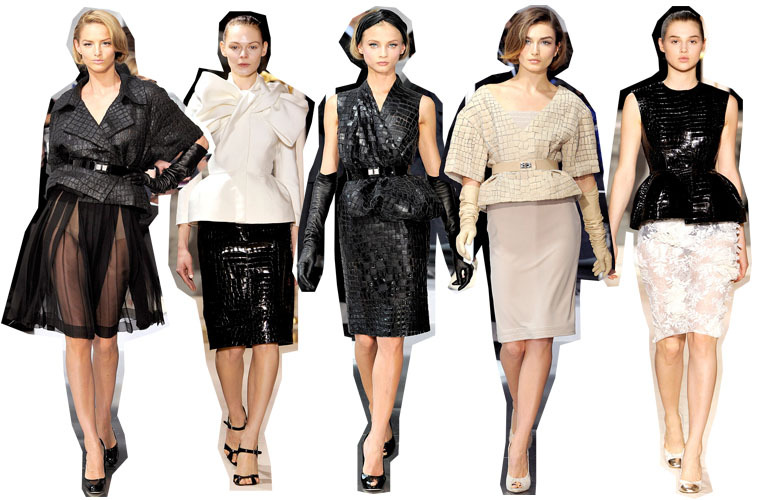 The Spring 2012 Couture shows have come to a close and as usual, designers have implemented corresponding elements in contrasting ways, making all of us writers categorize groups of looks into ‘trends‘. As much as I know that this type of content will be repeated on multiple platforms in similar manners, I believe looking at individual pieces by style is more worthwhile for us regular shoppers than looking at a collection in its entirety. Here, with looks by Chanel, Giambattista Valli and Elie Saab, three-dimensional florals are abundant. On everything from coats and skirts to tops and gowns, 3-D arrangements make dainty petals a little more bold, and a little less bland. If anything, they are reminiscent of ‘he loves me, he loves me not’ moments. As much as I love the Mugler, Yigal Azrouël and Vivienne Westwood type shows of this world, it’s always refreshing to see a wearable, human and flawlessly concerted collection. A.L.C.’s creator Andrea Lieberman conceptualized her brand to be just that. What resulted is a line of basics that go the extra mile, and lookbooks that look luxury and accessible all at once. A.L.C.’s Pre-Fall 2012 collection is brimming with vital staples that are sprinkled with seasonal trends like peter pan collars, mid-length hems and hints of minimalism. The result is a collection I could really see myself wearing, and one that I think really hits the mark for Pre-Fall. Pre-Fall 2012 collections have me dreaming of a day when my pile of jeans is layered in dust, and my wardrobe is bursting with silk graphic print pants; tribal, elegant, playful and beyond. We’ve seen our fair share of this trend (think: festival season… tribal utopia) but it’s my feeling that the cooler seasons’ wool capes, bomber jackets and fitted blazers are this item’s ultimate teammates. Next time you’re in a line up among a sea of blue jeans and leggings, be the one who’s sporting striking leg wear that no one can ignore – and own it. Now that I’m in a warm climate for the holidays, I can finally look through Spring 2012 collections without wanting to pick up and leave Canada forever. The delicate floral patterns, the pale colors and all of those shorts hems sure are something. 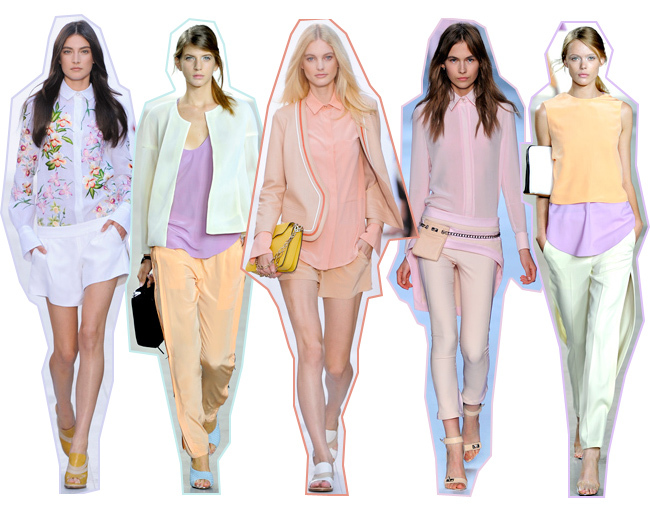 Pastels this year were anything but boring, and definitely gave new meaning to subdued coloring. Yummy shades in relaxed but tailored silhouettes…so dreamy. I was sifting through Spring 2012 ready-to-wear collections today when I noticed a glint of gold coming from the Yves Saint Laurent models’ feet. What’s more, the shine was offset by colors that are quintessentially Spring, in specifically mesmerizing hues. Upon closer examination, I found that the metal detailing seemed almost an after thought, with the rest of the shoe mirroring a classic loafer. The final product is a shoe that belongs on every Spring accessory edit, and maybe one day, if I’m lucky… in my very own closet. Undeniably, Stefano Pilati has proven that a metal plate and a modern hue can take a timeless piece to whole new heights. Perhaps you should consider throwing on a full skirt, layers of soft rose and a simple chignon this week? Pretty in pink never goes out of style. Lovely.